English rabbi, author, and expert on Hebrew music; born at Aldershot Nov. 14, 1862, and educated at Jews' College and University College, London. 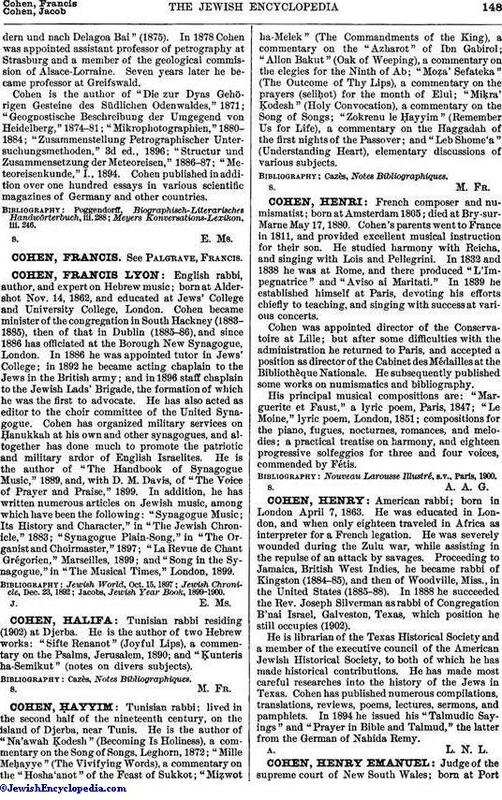 Cohen became minister of the congregation in South Hackney (1883-1885), then of that in Dublin (1885-86), and since 1886 has officiated at the Borough New Synagogue, London. In 1886 he was appointed tutor in Jews' College; in 1892 he became acting chaplain to the Jews in the British army; and in 1896 staff chaplain to the Jewish Lads' Brigade, the formation of which he was the first to advocate. He has also acted as editor to the choir committee of the United Synagogue. Cohen has organized military services on Ḥanukkah at his own and other synagogues, and altogether has done much to promote the patriotic and military ardor of English Israelites. He is the author of "The Handbook of Synagogue Music," 1889, and, with D. M. Davis, of "The Voice of Prayer and Praise," 1899. In addition, he has written numerous articles on Jewish music, among which have been the following: "Synagogue Music; Its History and Character," in "The Jewish Chronicle," 1883; "Synagogue Plain-Song," in "The Organist and Choirmaster," 1897; "La Revue de Chant Grégorien," Marseilles, 1899; and "Song in the Synagogue," in "The Musical Times," London, 1899. Jacobs, Jewish Year Book, 1899-1900.